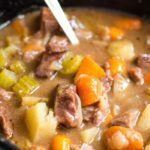 This hearty slow cooker beef stew is packed with seasoned well with all the potatoes, chuck roast, onions, carrots and celery. Just 4 to 6 hours in the slow cooker on high to get the full flavor. In a bowl, mix together the flour, salt, pepper and paprika. Add the cubed chuck roast to the slow cooker. Mix in the flour mixture to fully coat the stew meat. Cook on low for 10-12 hours or high for 4 to 6 hours. If you don’t have Hungarian paprika, you can substitute regular. I highly recommend purchasing Hungarian paprika when you can. The added flavor is amazing!